Haryana JBT Joining News 2017 - Haryana PRT/JBT Waiting/Low /FSL Pending Appointment Joining Letter - Haryana JBT Joining Latest News - Haryana 9870 JBT Final Selection List 2016-17 - Download Haryana 9455 JBT/ PRT Newly Selected Latest New - Haryana JBT Thumb Impression Verification Result 2015 - Check Haryana Primary Teacher M. A. Interview Marks latest updates on harprathmic.gov.in. Latest News (22.11.20180 - Haryana JBT Physical Verification Schedule under Advt. No. 2/2012 Cat No. 1 & 2 has been released Now. 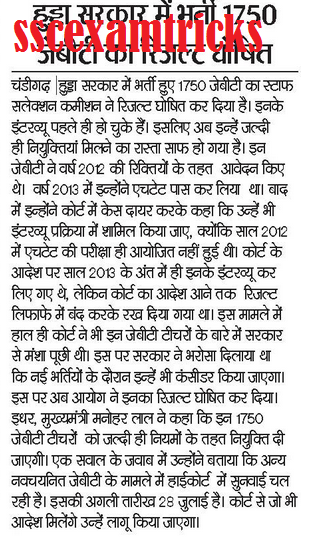 According to the sources, it is said that Haryana government looking in favor to provide / offer jobs across the state for waiting 2011 & 2013 candidates. Haryana JBT joining for Waiting candidates may be done in the month of June 2018 (after the holidays of students). 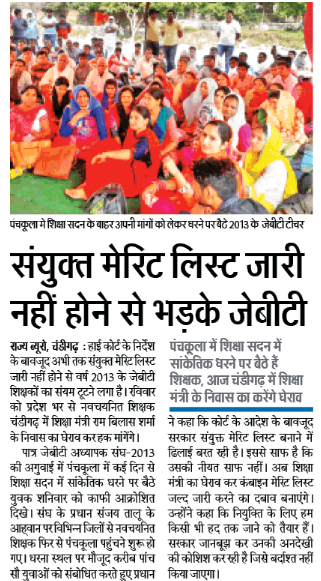 The candidates will have to take a little more patience for their joining in Government School of Haryana. The joining or appointment may be offer on the vacant seats / left over seat of Absentees in Haryana JBT Selection List 2018 released by the board. The selection list will be scrutinize in order to find the absentee and the joining may be done on the basis of merit list number as provided by the Haryana Prathemic/ School Education Board List. Recently, regular meeting with chief minister and other related official have been taken by the waiting candidates in order to request their joining on the vacant seat/ left over seat on absentees of signature and Thumb verification final selected candidates. These candidates you have to take more patience for their joining as the process is continue. Let's watch what would be happen in the end. when would the waiting candidates get their joining or they may be sort out from the recruitment process. It's all in the hand of government. We can hope positive as the government has pace the process of promoting teachers. 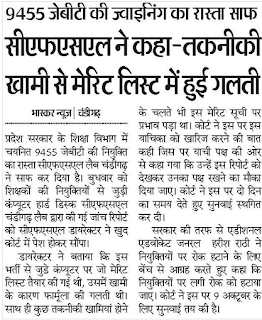 The good news is that for those candidates who have not attended the document verification schedule for recruitment of Haryana JBT Teachers. 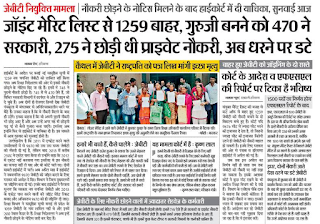 About 293 candidates were found absentee for document verification held at various times for final selection of 9870 PRT Teachers Bharti. These candidates are called for verification of original documents on 01st, 04th & 05th November 2017. The good news is that Haryana School Education Board has uploaded the list of selected candidates from FSL Pending List held for JBT appointment. The Haryana School Education Department has uploaded the list of 763 candidates (RoH Cadre) whom appointments were earlier pending and waiting for the appointment as per combined/ revised merit; now found eligible for Haryana JBT/ PRT Appointment 2017. The list of candidates 152 candidates (Mewat Cadre) has also uploaded who found eligible for appointment as per combined/ revised merit. The appointments of these candidates were also pending earlier. Those candidates who are seeking Haryana JBT FSL Pending Joining List; they can downloading it from direct link given here. The name, merit number, roll number, father name, category and allotment station have been mentioned in the selection list of Haryana JBT Joining. The attendance procedure will be commenced on Monday 10th July 2017 at their respective DEEO Office. It is expected that the issue on which one would the government be joined first JBT Waiting 2011 or HTET-2013 will be clear up to 24th May 2017. However, HSSC has given appointment to the newly selected candidates, but the candidates are still on hold for teaching. Their attendance is registered in DEEO office. Read the news in the below image. 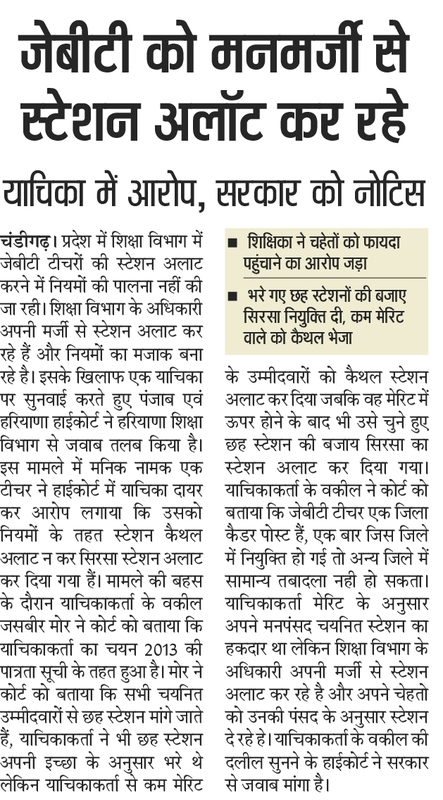 The appointment process along with Haryana JBT joining is on the track. A new list of selected candidates is expected to be available in the last week of May 2017 at www.harprathmic.gov.in. From the news and rumors, it can be assumed that this second recommended list for Haryana JBT joining may be of 2013 HTET candidates. It is looking that the waiting list candidates of Advt. 02/2012 may have more patience for their joining. In case, any recommended candidates for JBT posts may not join their allotted station, they may be asked for the vacant posts after waiting a predefined period of time (set by HSSC). On 28.04.2017: Character Certificate to be required at joining/appointment at DEEO Office by the candidates can be download from the below image. 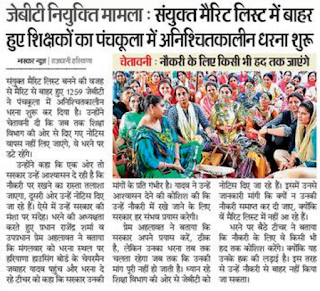 First of all, congratulations to all Haryana JBT teachers who have been struggling for their appointments/joining for a long time. 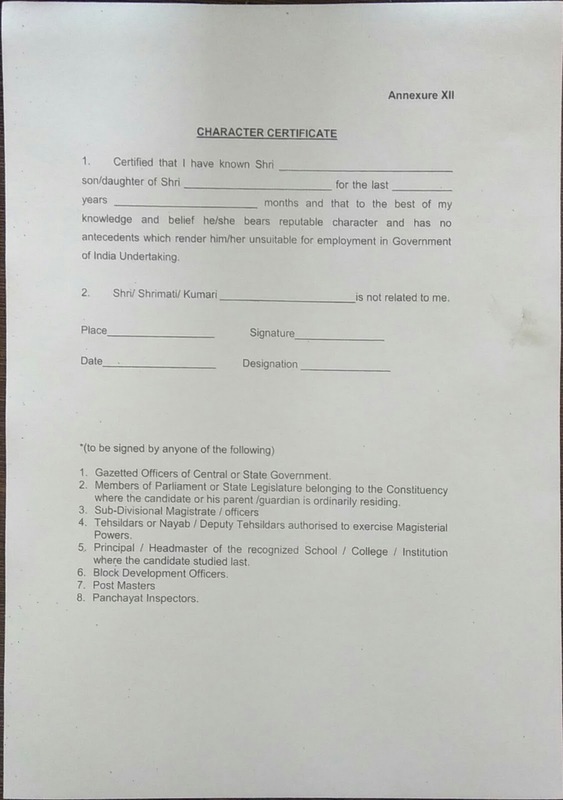 Specimen of Joining - Containing the instruction for the joining the list of documents to be required at the time of joining for the posts of JBT Teachers in Haryana Schools. (27.04.2017)The latest news is that the combined merit list of selected JBT candidates is likely to be available today (up to 5pm) at Haryana School Education board official website. It is also heared that the induction schedule for newly selected JBT Teachers has been prepared which will be commenced from 01st May 2017. Candidate must bring at least two/three set of attested photo copy along with original documents required at the venue of joining/appointment. However, there are still problems which need to be solved very soon, so, keep patience and stay with us. Read the full news in the given images. 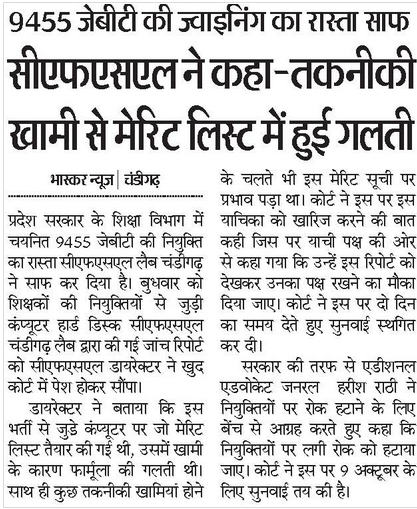 The good news is that Haryana School Education board has uploaded the station allotment list of 8374 selected candidates for JBT Teachers. (This list is received from the sources and can be varied from the original. The final allotment list can be downloaded from the official websites whenever available). Note - the above provided selection merit list is found to be released at the time of 14th August 2014. The new list which has already been prepared by the government is expected to be available within one or two days. 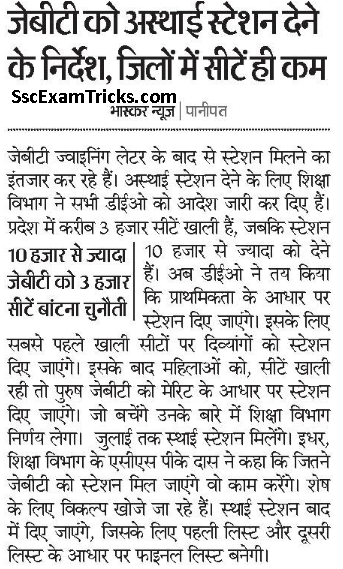 According to the sources, the joining process for haryana newly selected jbt teachers is on fire and a final merit list along with station allotment may be available on any of the links given here. The appointment with station allotment list will be available today. Haryana JBT Joining News (24.04.2017): A press conference will be organized on 24.04.2017 in the evening by the goverment regarding the newly selected JBT teachers. News from the sources that all the selected teachers will be given joining to the designated station very soon. 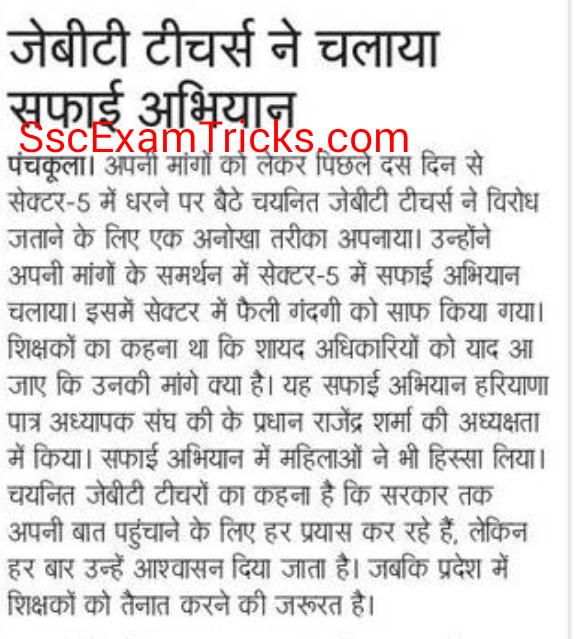 The final selection list for Haryana JBT Teachers will be available either at www.harprathmic.gov.in (in latest news section) or www.hssc.gov.in (in the notice board). The candidates are advised to keep visiting us as well as the official website for any latest updates about the uploading of final selection merit list of the candidates. 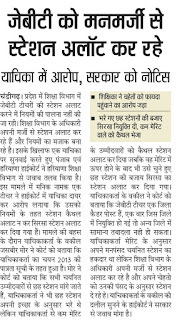 According to the sources, honorable P&H high court has removed the stay on Joining of JBT teachers in Haryana. 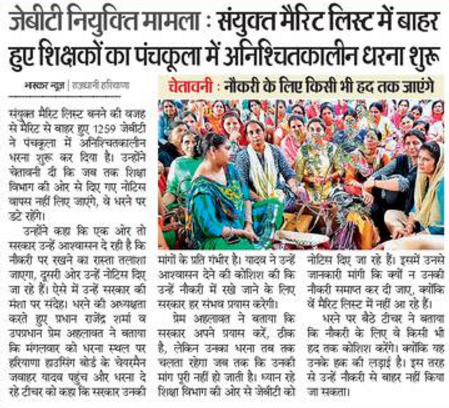 Now its time for the joining and it is in the governments hand when will they give joining to these newly selected jbt teachers. Besides that the verification of thumb impression and signatures have been completed by the selection board. The final result of thumb impression verification will be uploaded soon. 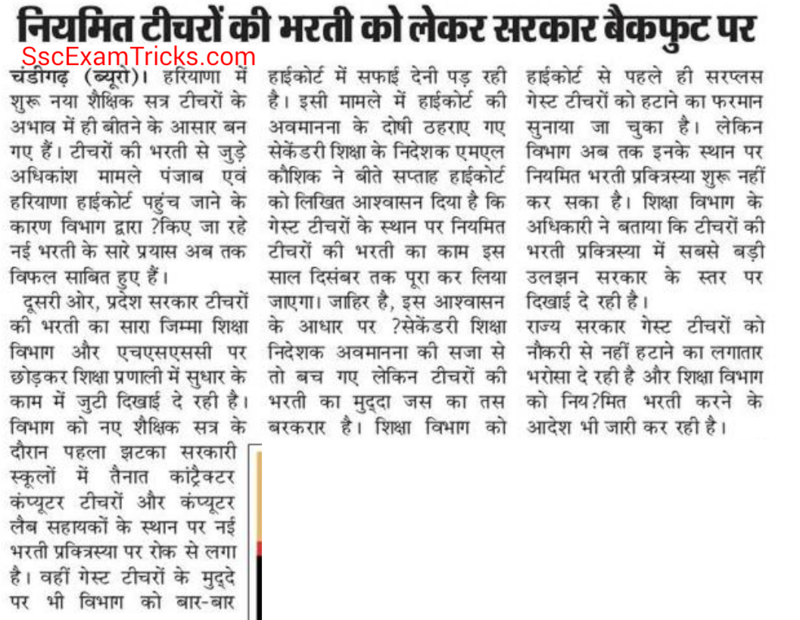 Read full news in the below image. Latest News (08.04.2017): Read the full news given in the below image. Latest News/Updates (11.03.2017): The newly selected JBT teachers have to wait a little more for their joining (see complete news in images). Hearing on 15th Feb 2017: The hearing of Haryana JBT joining on this date was held not more than five minutes due to the case was listed in the end. A new date was given for next hearing. Hearing of 02nd December 2016: The hearing was held for few minutes and new date has been announced. The next hearing will be held on 15th Feb 2017. Haryana JBT Joining High Court Result of Hearing held on 15th November 2016: No result was declared by the honorable court. In spite of declaring result of Haryana JBT Joining Issue, the court has announced a new date of hearing. The next hearing will be held on 02nd December 2016. Earlier the 06th December 2016 was selected as hearing date by the court. But, the date has been revised by the court and 02nd December 2016 was declared as hearing date on issue of Haryana JBT Joining. Highlight of P & H high Court on Haryana JBT Joining Issue on 29th August 2016: The hearing was conducted for not more that ten minutes and a new date of hearing was given by the honorable high court. Again next hearing on Haryana JBT joining issue will be held on 15th November 2016. 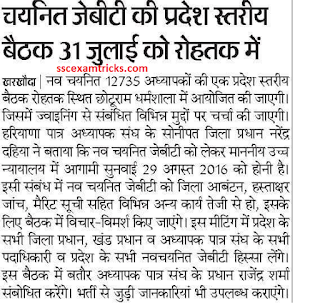 Haryana JBT Joining news (30.07.2016): The next hearing on the issue of joining of Haryana newly selected JBT teachers will be held on 29th August 2016. The list of newly selected candidates for JBT posts has been extended up to 12735 and all these candidates are still waiting for their joining. Besides that signature verification, station allotment, final selection merit list process is under preparation and is expected to be finished very shortly by the Haryana Prathmic. 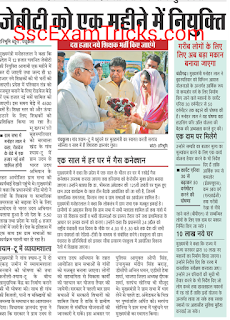 Latest News on 30.05.2016: The biggest news is that Haryana JBT joining is to be made up to end of this year i.e. probably December 2016. Haryana JBT joining Court Case 28.05.2016: The latest news is that P& H high court has continued stay on JBT joining on 28th May 2018 hearing. The next hearing of Haryana JBT Joining has been scheduled on 20th July 2016. 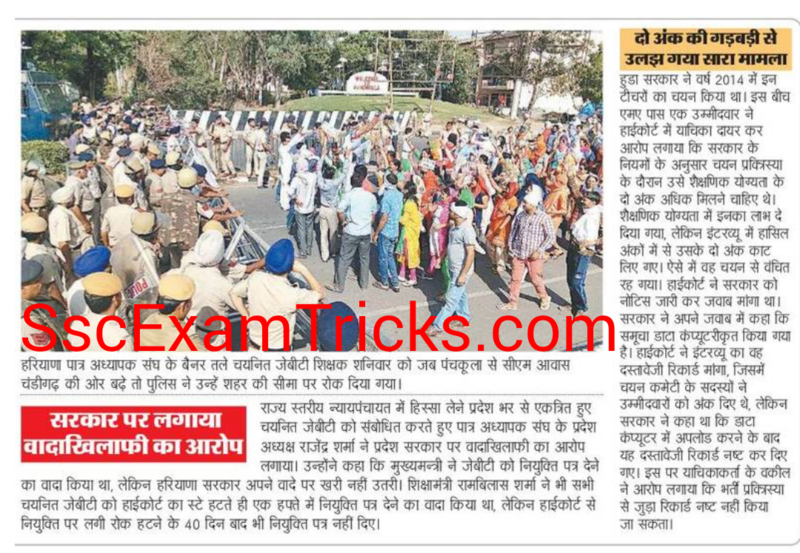 Haryana JBT Teacher Bharti Protest: The pieceful protest of Haryana JBT Teachers to remind Haryana Government for joining has been continued on 28th May 2016. 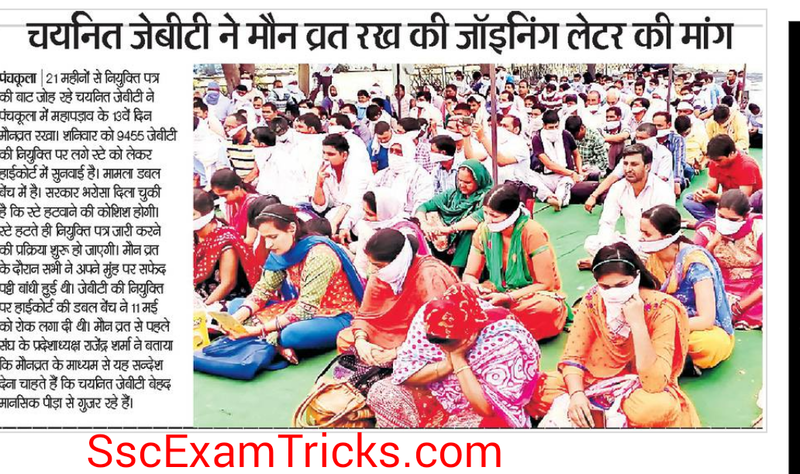 Haryana JBT Teacher Joining News (25.05.2016): On the 10th day protest of Haryana JBT teacher on the demand for joining, the contender initiated cleanliness Abhiyan at Panchkula. 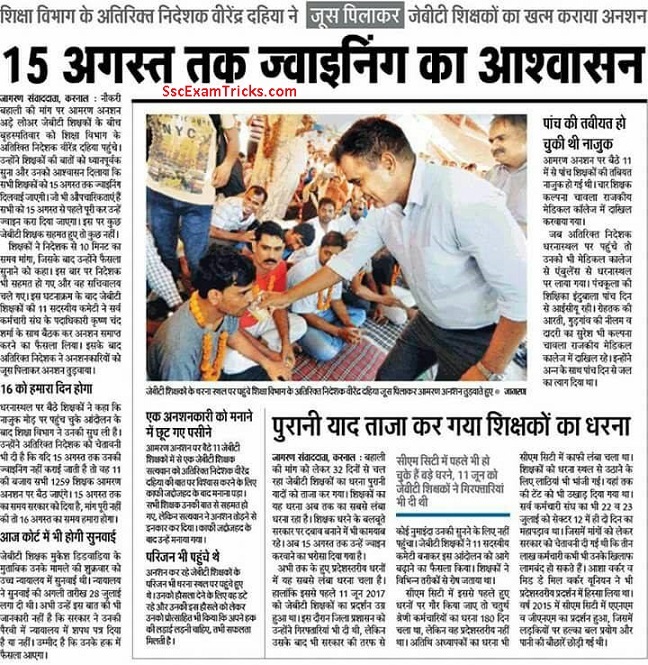 Haryana JBT Teacher joining latest news (16.05.2016): The amran ansan has been started by Haryana Newly selected JBTs on 15th May 2016 at Panchkula, Haryana. The protest has moved to encircle CM's residenceanf faced lathicharge and water canon by police to stop the agitation. Read full news here. 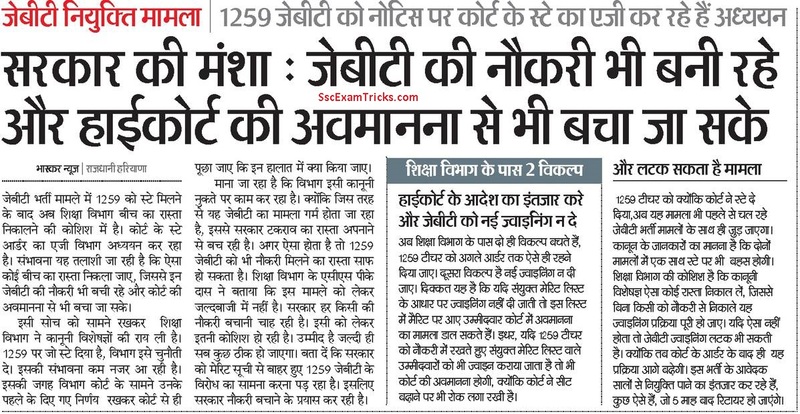 Haryana JBT Joining News (12.05.2016): The breaking news is that P&H High Court has imposed stay on Haryana JBT Teacher Joining on 11.05.2016 after hearing the petition on MA Marks (2 marks issue). 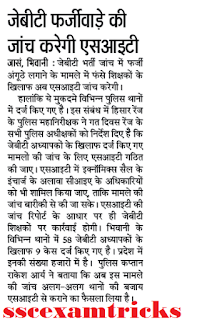 The case has been registered against and the verification / investigation will be made from the starting again. 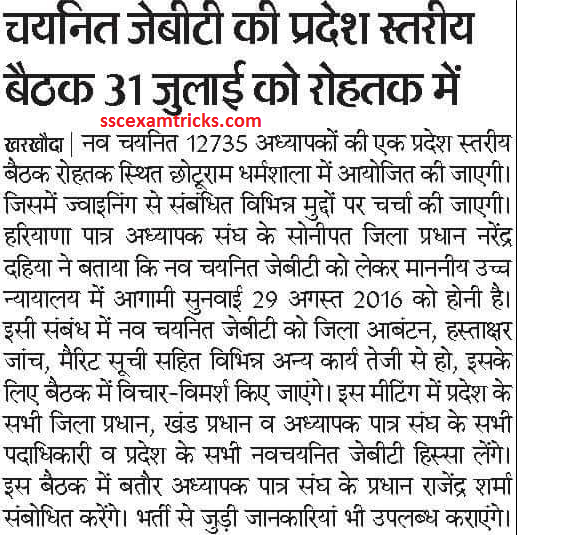 Haryana JBT Joining News (11.05.2016): the big news that Haryana JBT Joining process for 3209 candidates is slowly on its a way and final allotment list may be uploaded very shortly on harprathmic.gov.in. 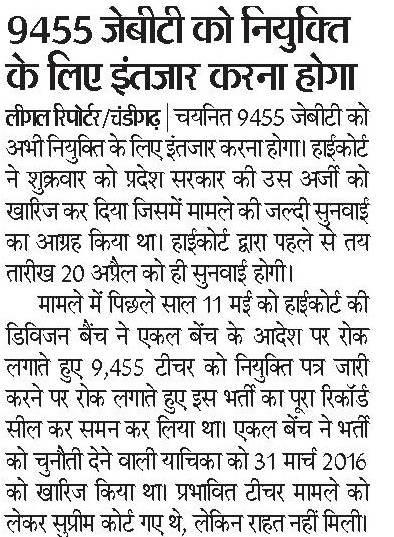 Earlier 9870 vacancies were made available for JBT posts Haryana Government schools and 9455 candidates got selected for these posts. 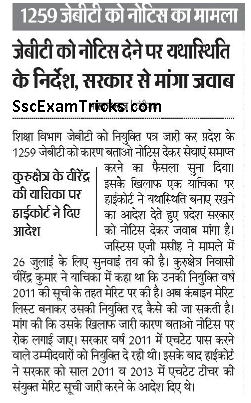 The final result was announced on 14th August 2015 but verification of thumb impression, MA marks in interview and original documents is under process. Read the full news in the image given below. 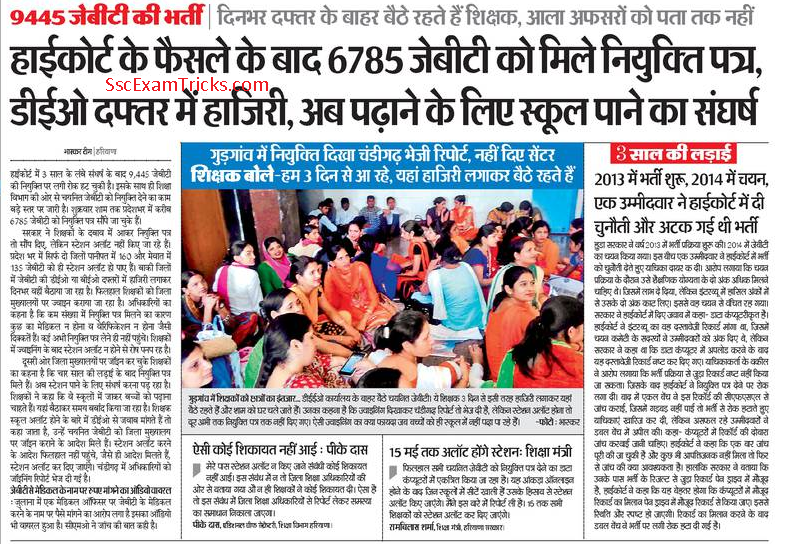 On 16.11.2015: Haryana 9870 JBT / PRT Joining Latest News: The Hon'ble Punjab & Haryana High Court has postponed Haryana JBT / PRT joining of 9870 newly selected teachers and next hearing will be conducted on 28th November 2015. Read the full news in image provided below. 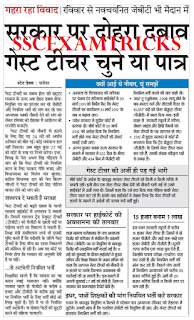 It is latest news that Haryana Govt. 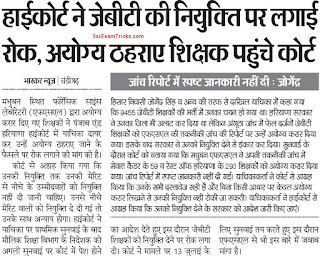 have filled plea for rejoining of Terminated Guest Teachers and hearing in Punjab & Haryana High court will be held very soon. 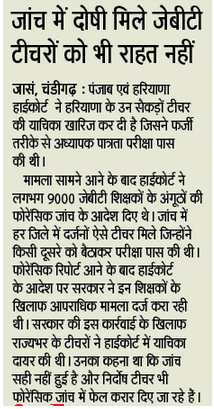 On 13.10.2015: Haryana JBT Joining News for 9870 newly selected JBT/PRT Teachers. Read full news in the image provided below. 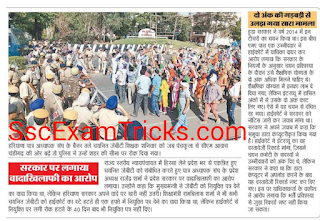 Latest News on 09.10.2015: Haryana JBT joining of newly selected candidates has continually stayed by Punjab & Haryana High Court hearing on 08.10.2015. The next hearing has been scheduled on 12.10.2015 (Tuesday). Read latest information on the image given below. 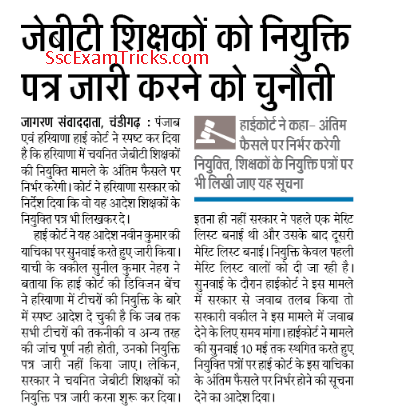 Haryana JBT Joining News: (Latest News on 07.10.2015): On Hearing in Punjab and Haryana High court, on 07.10.2015, the joining of newly selected JBT/ PRT teachers will be clear to continue by CFSL, Chandigarh. The report related to the newly selected joining of JBT teachers after verification of computer hard disk has been submitted to the court. The merit list prepared in the computer was little altered due to application of wrong formula. 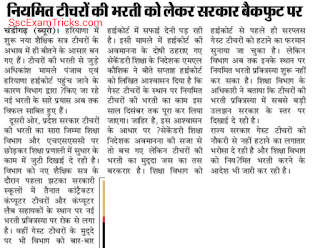 It was also request to the court for continuing the joining process of newly selected JBT. The next hearing will be conducted on 09th October 2015. Read the full news given in the image provided below. 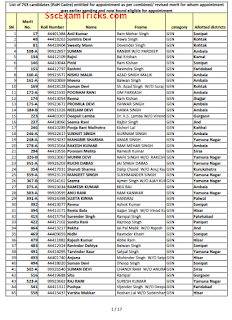 Haryana JBT/PRT Final Selection List Latest News - Download Haryana PRT New Schedule of Finger Verification Released For Absentee of Mewat, Non-Mewat & Rest of Haryana Region- Newly Selected Haryana PRT Thumb Impression Schedule Released: Read full news in the image provided below. 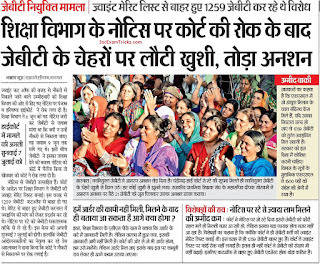 Latest News on 16.09.2015: The Review Petition of Farzi JBT / Teachers Rejected by Punjab & Haryana High Court. This is big news that Punjab & Haryana High court has rejected plea from those jbt/ teacher who had qualified HTET by farzi process (the process in which HTET exam qualified by other person than applied). 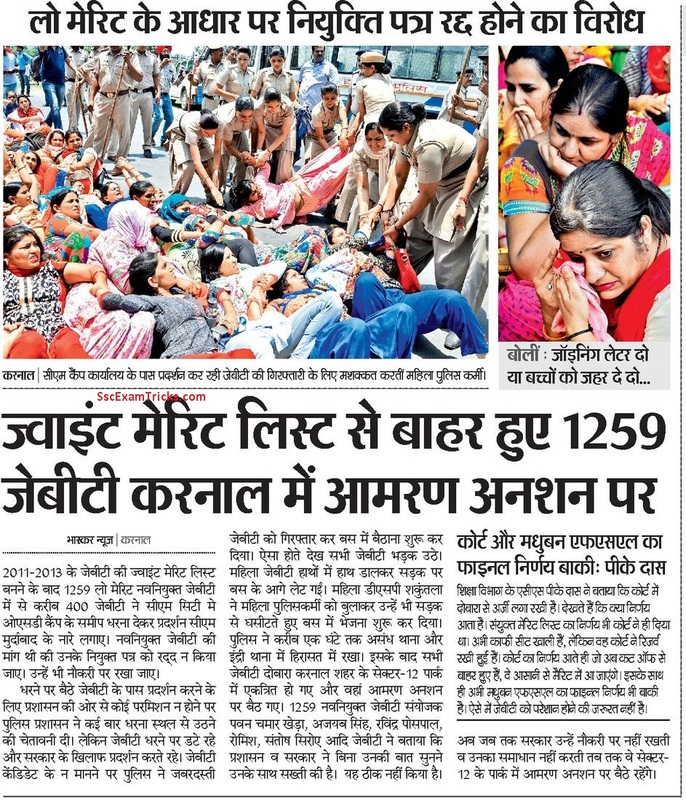 Earlier Haryana Govt. had conducted verification of thumb impression process of 9000 JBT teachers in which hundreds of candidates had found unmatched. The govt. 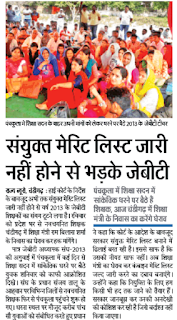 has identified and planning to punish these farzi jbt / teachers. You can read full detail from the image provided below. Latest News 10.08.2015: This is latest news that Haryana Government has successfully completed thumb impression checking of 7000 candidates. As per resources news, the verification will be completed in the end of August 2015 and joining is expected to be started in the first week of September 2015. 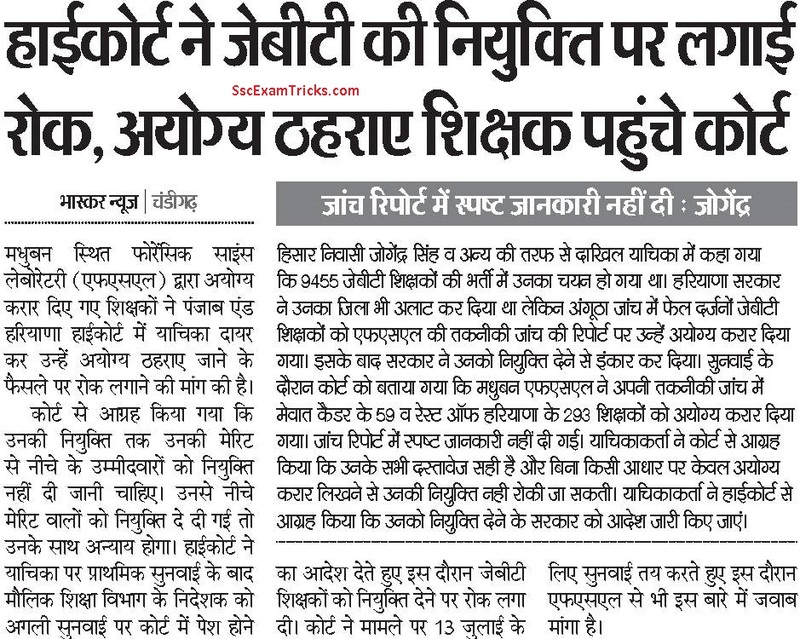 This is latest news that Punjab & Haryana high court has given 10 week time period for recruitment of newly selected Haryana 9455 JBT for various government schools in the state. The thumb impression result is likely to be declared in August 2015. 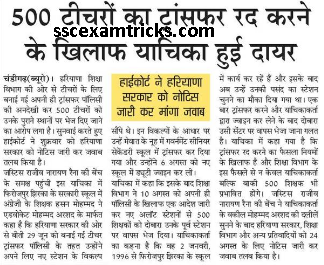 The thumb impression of 6000 candidates has been completed and Haryana Government is seeking 2-3 months time period for checking thumb impression of rest of candidates. You can read latest news on the newspaper cutting provided below. Pubjab & Haryana High Court Hearing on 03 August 2015: By considering on the plea on consideration of HTET 2013 candidates for Advt 02/2012 (HTET 2012), Punjab & Haryana High Court asked Haryana Government that how HTET 2013 will be considered for Advt. 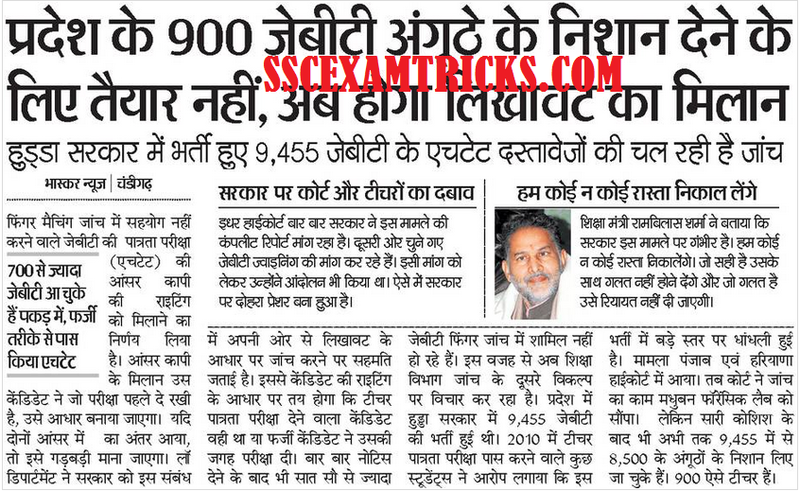 02/2012 as the advertisement had eligibility condition of HTET 2012 (or before) qualified could be applied for Haryana 9870 JBT posts. Haryana JBT Joining list will be published on 10th August 2015 on official website. The Joining of newly selected Haryana JBT will be done up to 15th August 2015 as per Punjab and Haryana High court instructions. Hearing date in Punjab & Haryana High Court on 03 August 2015. 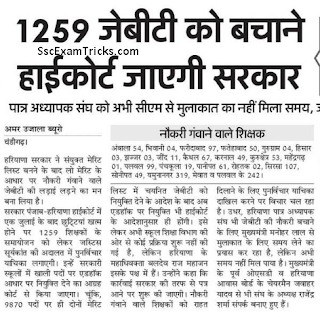 Total 1362 Number of Candidates have been found unmatched and 111 candidates are under suspicious. Punjab and Haryana High Court hearing was held on 28.07.2015 with Haryana Government on the issue of JBT/ PRT Joining /Appointment of 9455 newly selected candidates against 9870 JBT Recruitment Advt. 02/2012. Haryana JBT Joining Latest News is that High Court has asked Haryana Government to submit thumb impression and document verification result with in 10 days after assurance / verification of no discrepancy in report. 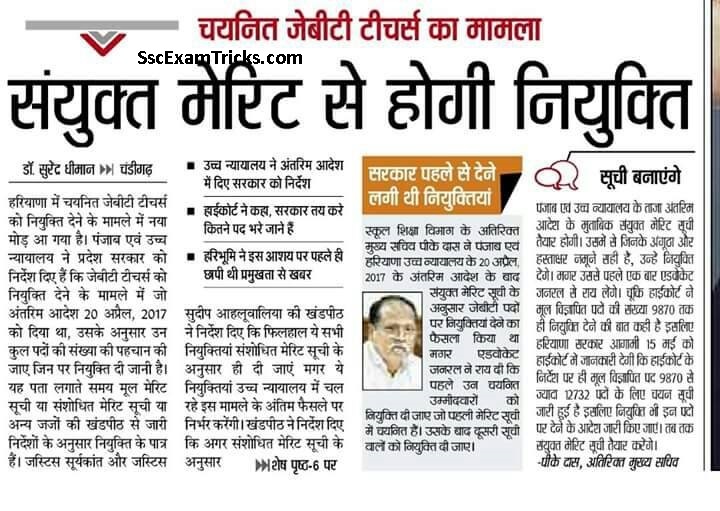 The Haryana JBT Joining / appointment process will be started then. 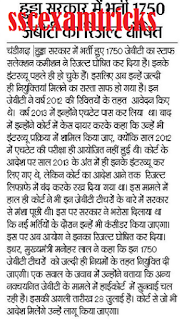 It is expected to that Haryana 9870 JBT Joining / Appointment list will be declared on 07.08.2015 on official website. 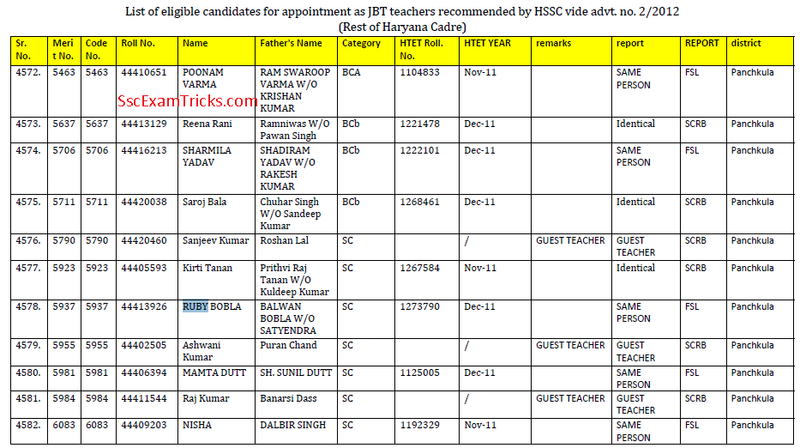 The direct link to check Haryana JBT / PRT Joining List is given below. 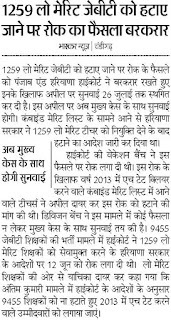 Besides that the hearing of Haryana 1750 JBT Joininig (HTET 2013) in Punjab & Haryana High Court will be held on 03.08.2015. 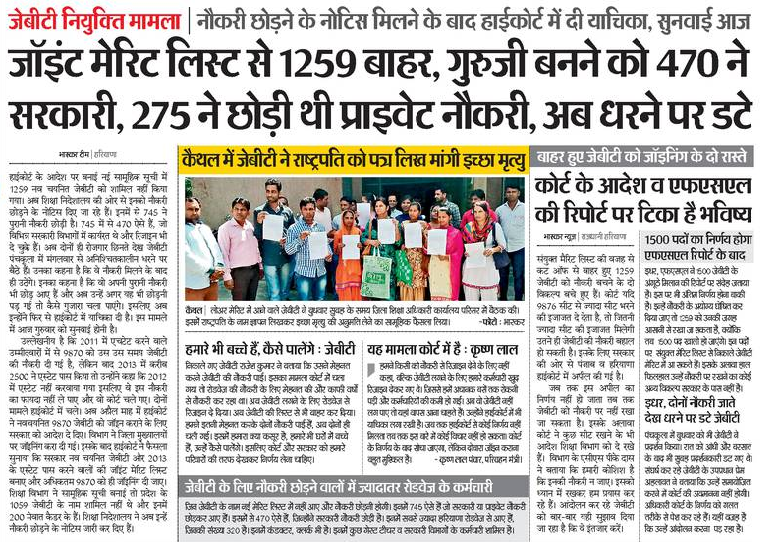 Latest Joining News on 21.07.2015.: On Tuesday, Pubjab & Haryana High Court has put stay on recruitment process of 1750 (or approx. 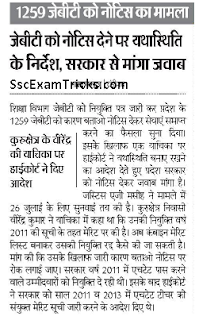 1800) JBT who had qualified HTET 2013 and counted for recruitment process of 9870 JBT/ PRT Advt. No. 02/2012. 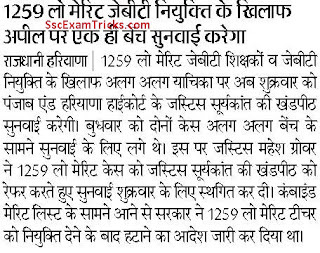 Latest News on 14.07.2015.: Haryana Staff Selection Commission has declared list of additional candidates on 14.07.2015 for Haryana 9870 JBT/ PRT Recruitment 2015. 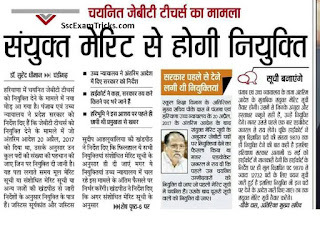 The HTET 2013 candidates interview result has been declared on official website. 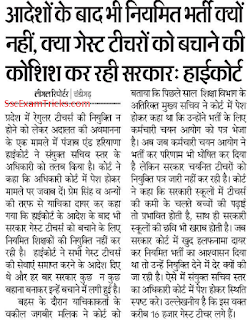 This is latest news that Haryana Govt will submit plea for the permission of joining / appointment of Haryana JBT / PRT Teachers from High Court on 28th July 2015. 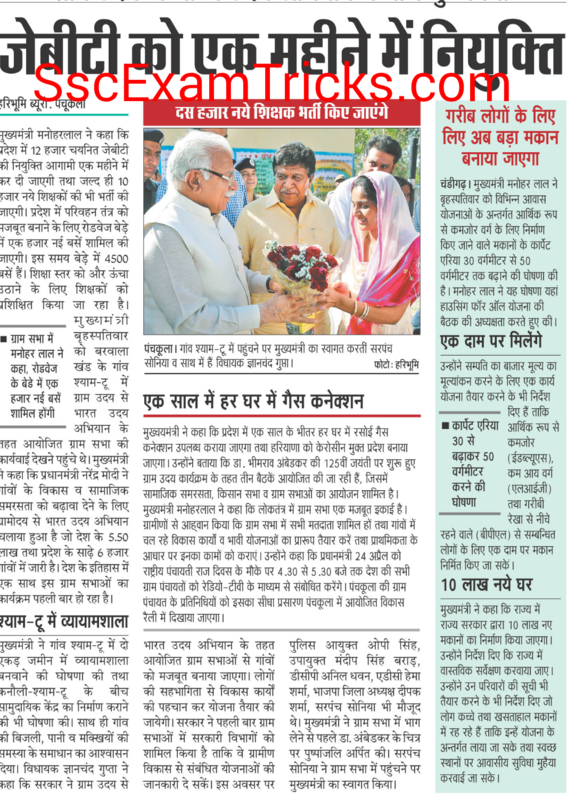 Haryana Govt. will distribute the appointment letter to the newly selected Haryana JBT / PRT Teachers on 31st July 2015. 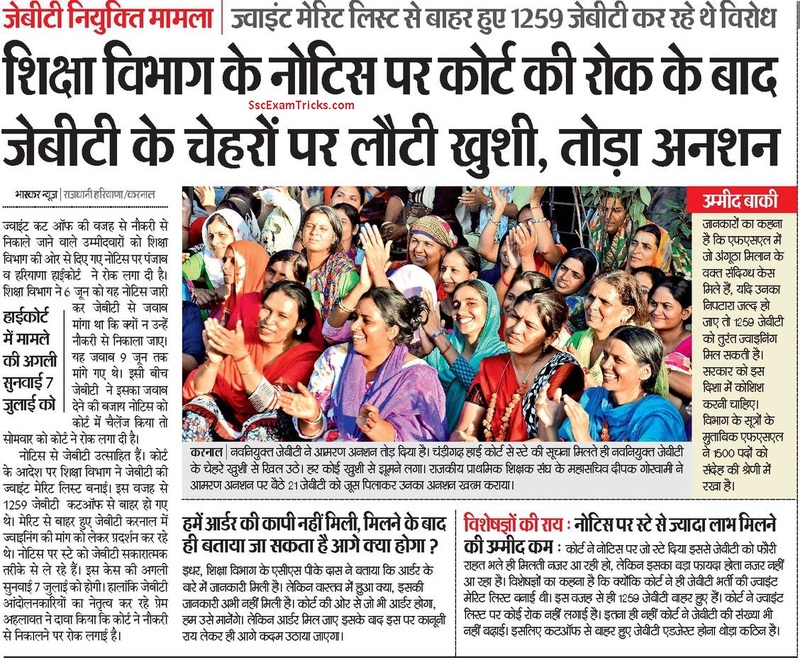 The protest of newly selected for Joining of Haryana JBT/ PRT Teachers has been stopped due to assurance of CM of Haryana Govt for appointment till 31st July 2015. If above link does not work, then click on the link given below. 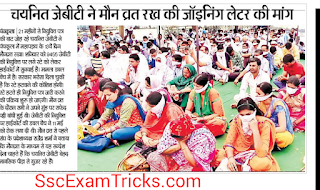 It is latest updates on the issue of ANSAN conducted by PATRA ADHYAPAK (Newly Selected 9455 Haryana JBT Candidates) is that they are given assurance to get joining on or before 31st July 2015 by the authority of Haryana Govt. (Source: Several Newspaper). These PATRA ADHYAPAK are waiting for Joining / Appointment / Final result of document verification of the candidates. 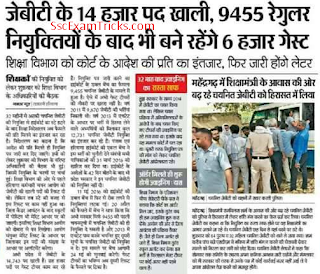 This is latest news that Haryana Government is going to declare Thumb Impression and Document Verification Result of newly selected 9455 Primary Teacher (JBT Teachers) on or after 15th July 2015. 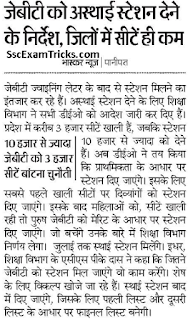 It is assumed that the final selection list of Haryana JBT Teachers will be done in the month of after 15th July 2015. Earlier Chief Minister Sh. 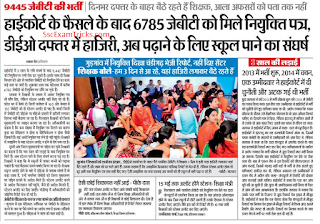 Manohar Lal Khhatar had declared on 23rd March 2015 that the appointment letter of newly selected JBT Teacher (Total 9455 Candidates) will be distributed by 77 working days. 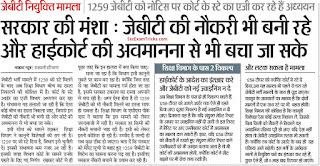 So now the thumb impression and document verification of newly selected JBT Teachers are under process and result will be declared on or before 15th July 2015 (expected). It is also assumed that the JBT Guest Teachers in Haryana will be relieved after the announcement of final appointment or final selection list of newly selected Haryana JBT Teachers. 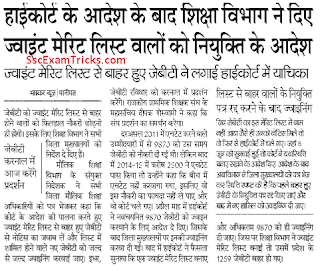 Appointment /Joining of Haryana JBT Teacher - On or before 31st July 2015. 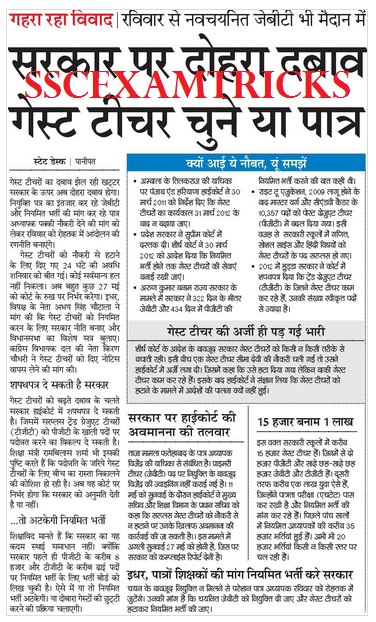 It is expected that the Joining of Haryana JBT (PRT) will be done in the month of July 2015. The Haryana Government will present the list of joining of newly selected PRT for Final Selection and will seek permission to give appointment to these newly selected candidates. Punchkula District - 75 Candidates. 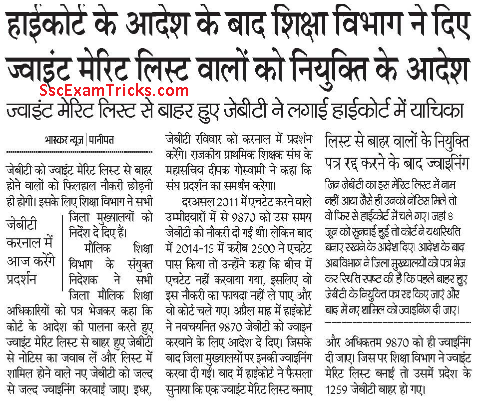 Latest Updates/ Latest News on 24th May 2015 - Newly selected Haryana JBT (PRT) Teacher candidates are going to have meeting together at Rohtak on 24th May 2015 (Sunday). 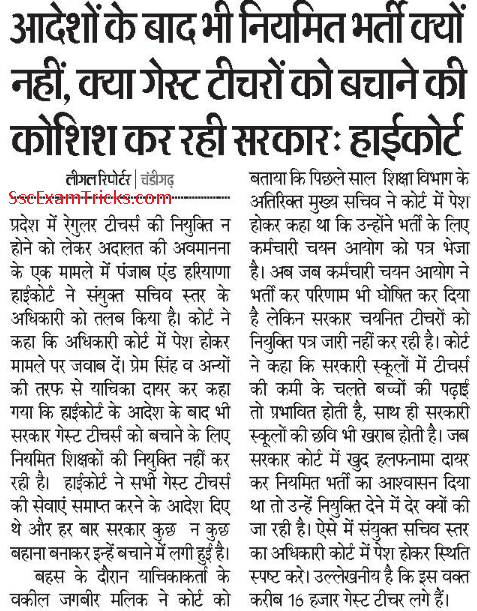 They are demanding and also try to pressurize Haryana Government for speeding up the process of Final Selection of Newly Selected Haryana JBT (PRT) Teacher Candidates. 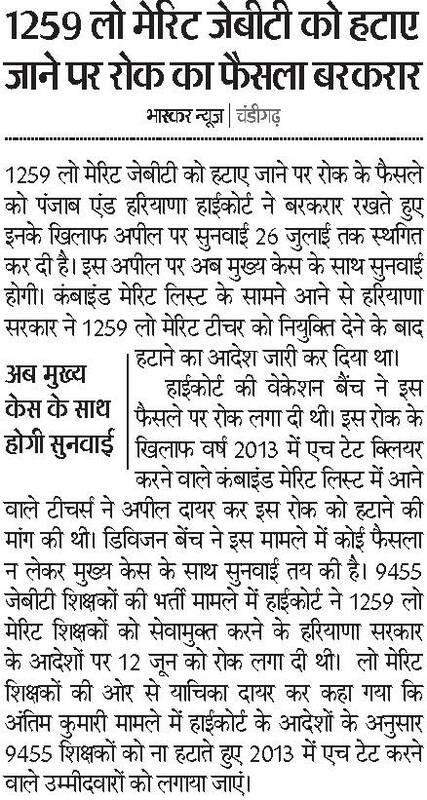 The next hearing of relieving Surplus Haryana Guest Teacher will be held on 27th May 2015 by Honorable Punjab & Haryana High Court. The latest news is High Court has strictly order to eliminate the service of Surplus 4073 up to their next hearing which is going to be held on 27th May 2015 and JBT PRT Thumb impression schedule is soon to be announced on official website. 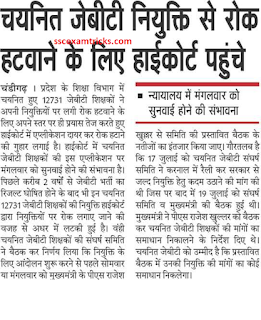 The latest news is that Pubjab & Haryana High Court had strictly declared to relieve 4073 Guest Teacher till 11th May 2015. Haryana JBT/PRT Final Selection List Latest News: The latest news is that HBSE is under working to release the final selection list of Haryana JBT on the official website. 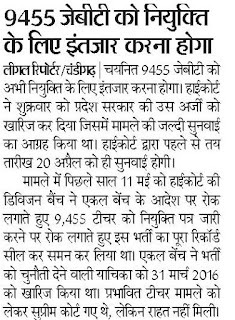 Haryana governement is expected to release the Final Merit List very soon for a total of 9870 posts of JBT/ PRT in Mewat and Non-Mewat Region. It is expected that the final list will be released in First week or second week in May 2015. We will update immediately as it gets released on Official website. Earlier HBSE had conducted thumb impression and document verification schedule (total three times) for these provisionally selected candidates through merit number provided to the candidates in recommended list released on the official website. 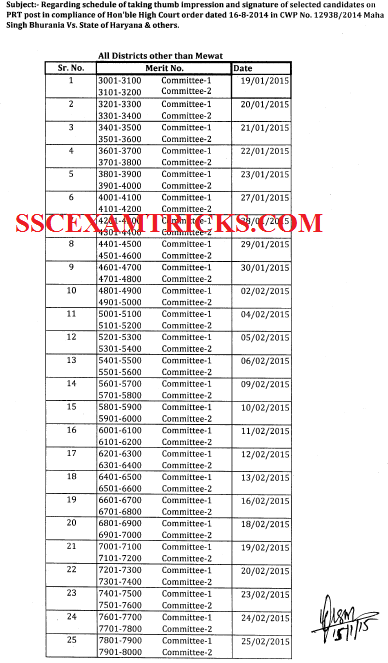 HBSE had also released thumb impression schedule to absentiee candidates. It is expected that the result of document verification schedule will be declared on the official website in which the document verification status will be mentioned against name, father name, merit number and address of the candidates. HBSE will mention the reason of rejection of candidature due to certain reason in the thumb impression and document verification result which is expected to be released in the month of June/ July 2015. Note - The expectation is just predicted or imaginative, not official. 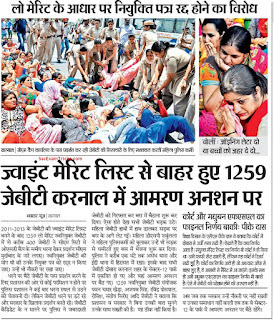 The Final decision will be taken by Authority of Haryana. No query in this regard will be entertained. Kindly visit official website for true updates and latest news for which direct link is provided in this post. Haryana Board of School Education has released the last and final schedule of Thumb impression and document verification for absentee of all previous thumb impression session on 31st March 2015 on official website to match the originality of the candidates. The thumb impression & verification will be done on 09th April 2015 and 10th April 2015 for Merit No. 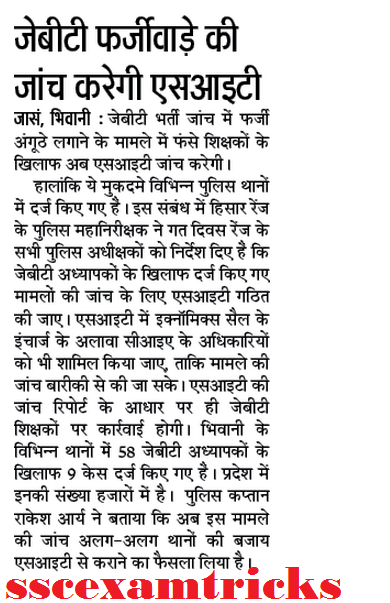 from 02 to 4595 (Non-Mewat Cadre) & 01 to 1170 (Mewat Cadre) and 4615 to 9045 (Non-Mewat Cadre) respectively. The Thumb impression will be started from 09:00 AM onward at Adhyapak Bhawan, HBSE Board, Bhiwani. Those candidates who got absent in last schedule which was conducted on 17th, 18th & 19th March 2015, they can attend last / final thumb impression schedule at the venue mentioned above. 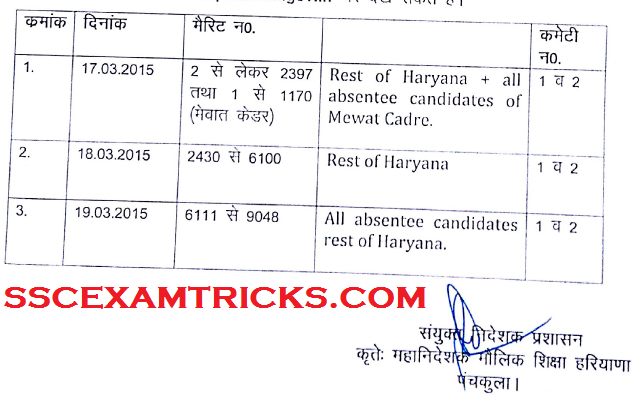 Thumb Impression Schedule of Absentee Candidates: Haryana Board of School Education has released new Thumb impression and verification schedule released on 16th March 2015 for all absentee candidates of Mewat, Non-Mewat & all candidates of rest of Haryana from 17th March 2015 to 19th March 2015. 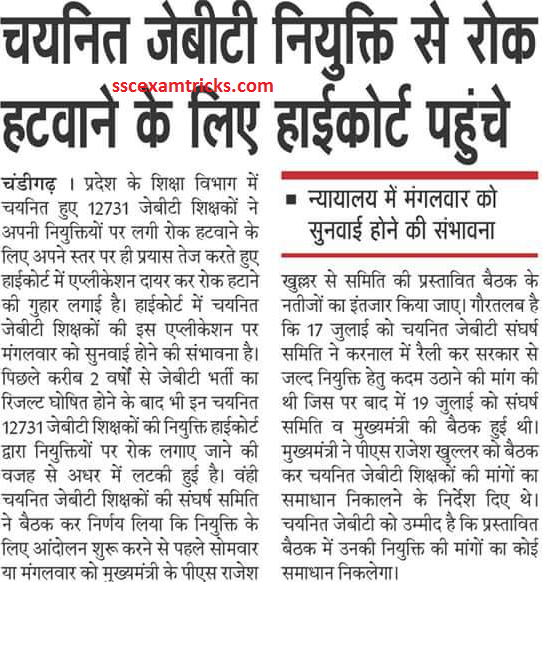 Haryana Board of School Education had completed Thumb impression and verification schedule of Non-Mewat Cadre on 04th March 2015 (Up to 9000 Rank number/ Merit No.) 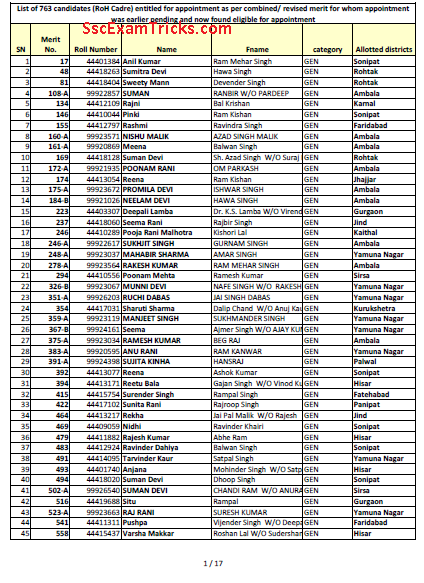 based on the Recommended Selection Merit list of candidates which was released on 15th January 2015. 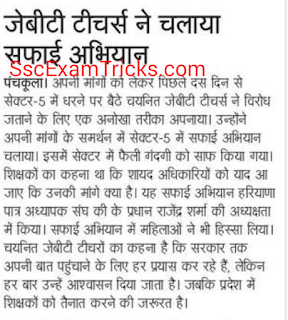 The latest news is that in this process of thumb impression and verification schedule Absenteeism of candidates is expected to be around 500-550 candidates and it is predicted that the candidates who was in waiting list will be considered for getting appointment on the posts released for Haryana JBT. The thumb verification and verification schedule of left candidates Non-Mewat Cadre and Mewat Cadre will be conducted from 09th March 2015 to 17th March 2015. The result of Thumb impression and verification will be released after 17th March 2015 on the official website www.harprathmic.gov.in. 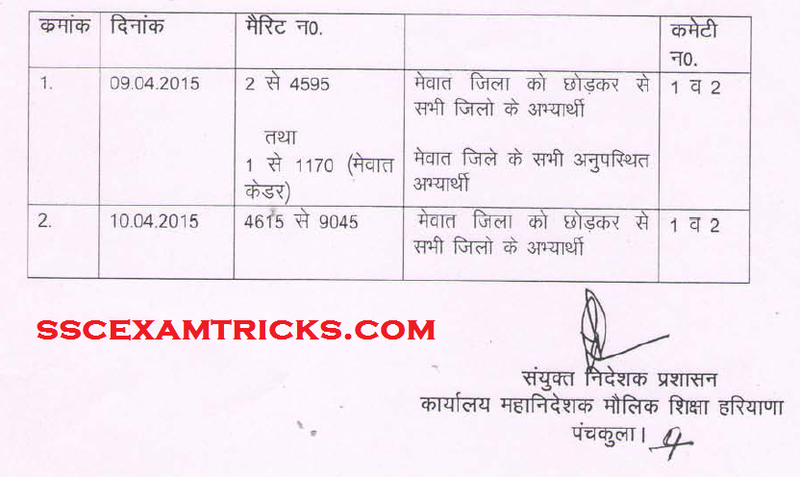 Haryana JBT Mewat Cadre Thumb Impression and Verification schedule Latest updates- These candidates are advised to be on the schedule date and time as mentioned against the recommended selection merit list i.e. at 9:00 AM at sharp at Adhyapak Bhawan, Haryana Board of School Education, Bhiwani. 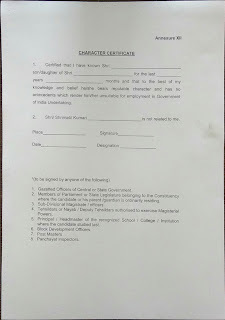 It is recommended that candidates must bring HTET certificate and two original photo identity proof (Adhar Card, Voter Card, PAN Card), three coloured passport size photographs and verification form. These candidates are required to fill verification form which is already released on the official website. At the venue of verification, it will be instructed to the candidates about how to fill verification form carefully. Candidates must note that NO CUTTING WILL BE ALLOWED IN THUMB IMPRESSION VERIFICATION FORM. Candidates are required to fill verification form at the time of verification only. No form will be permitted already filled at the venue of Thumb impression. 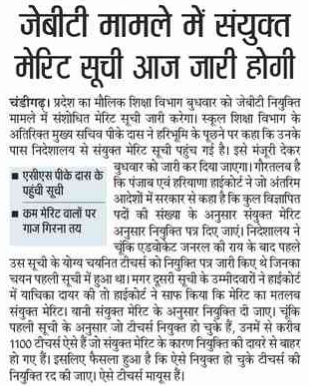 The candidates will be confer to the verification committee and viva-vice will be done (say verification of name, father/ husband name, permanent address, 10th marks, 12th Marks, year of passing etc.) at the time of thumb verification session. Candidates are required to make 6-9 signature and thumb impression of both thumbs. A photo will be clicked at the time of thumb verification session. It is advised to the candidates to verify their documents and revise their marks and year mentioned at the time of thumb impression verification. 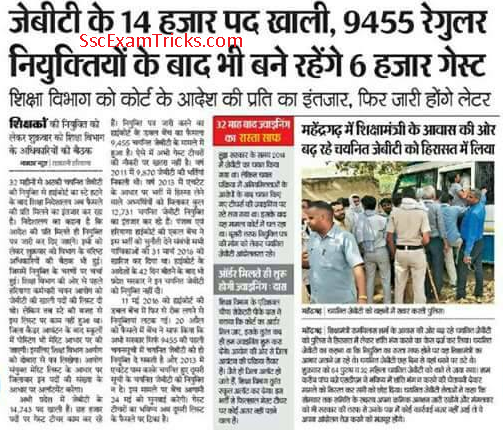 Haryana PRT/ JBT Final result - It is expected that the result will be announced in the end of month March 2015 and in the first week of April 2015. New Schedule of Finger Print Verification of JBT Thumb Impression Verification Schedule of PRT for Mewat & Non-Mewat Region Newly Selected Candidates Finger Print Verification Schedule Released Check Thumb Impression Verification Schedule for Newly Selected JBT in Haryana- Haryana JBT Latest Updates: The latest news is that thousands of candidates have been verified for thumb impression along with signature and document verification especially HTET Certificate (Original) of the candidates. A total of 200 candidates are scheduled for verification of originality of the candidates by Committee 1 and Committee 2. From resources, it is in news that many candidates have got absent during this verification schedule. It is advised to the candidates to bring their original documents along with 2-3 passport size photograph or any other relevant document which shows the originality of the candidate. 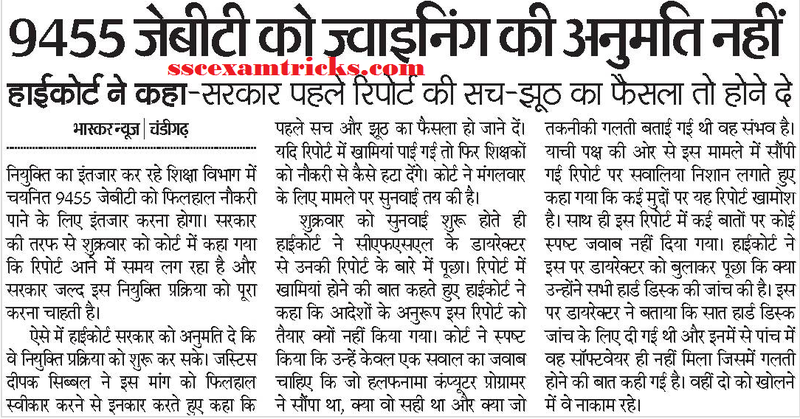 This is great golden chance to original / deserving candidates to get government job/ teaching job in Haryana. So candidates are suggested to do their level best during the finger print verification process to check the originality of the candidates in front of the committee 1 or committee 2. Don't leave a single chance to grab these jobs. SSCEXAMTRICKS.COM wishes you all the best for your finger print verification schedule. Those candidates who had attended this verification schedule are required to wait till the end of the verification i.e. 17th March 2014. Then the Final Result of Haryana JBT Recruitment of the short listed candidates based on the measurement/ analysis of finger print verification schedule will be announced very soon. Final List of selected will be released on the official website of Haryana JBT. These candidates will be provided station for joining duty/ appointment letter for the job along with joining date/ reporting date to join as JBT teacher in Government Schools. The station of Joining will be provided based on the choices filled by the candidates during filling of application form. Earlier Haryana School Education Selection Board (HSESB) has released the latest schedule of Finger Print Verification / Thumb Impression Verification of newly selected candidates for the posts of JBT (PRT) for various government schools in Haryana. These newly selected candidates have to reach at venue Adhyapk Bhawan situated in Board of School Education, Bhiwani on the date mentioned against Merit Number. The list contains the merit list for Mewat Region and Non-Mewat Region. The list of newly selected candidates of Merit No. 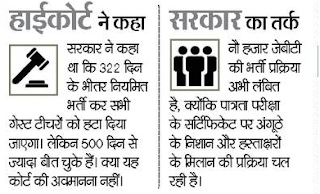 3001 – 9048 of Non-Mewat Region will have to reach for finger print verification of the candidate between 19th January 2015 to 09th March 2015 and Merit No. 1-1170 of Mewat Region will have to reach for Finger Verification of the candidate between 09th March to 17th March 2015. These candidates carry photo identity of the candidate such as Voter Card, Adhar Card etc., signature identity such as PAN Card, HTET Certificate and two passport size photographs for the process of thumb impression verification conducted by HSESB. Earlier HSTSB recommended Merit List of Junior Basic Teacher (JBT) for Mewat & Non-Mewat Region on the official website of Haryana Prathmic Education. This is in the news that the process of Overall verification of candidate from the selected list of candidates is continuing from 29th December 2014- 16th January 2015 for Merit Number 1-3000 by committee 1 & 2. These candidates are called for physical verification of Finger Print Verification/ Overall verification of Finger print, Signature matching & photograph matching with candidate (Candidate identity). 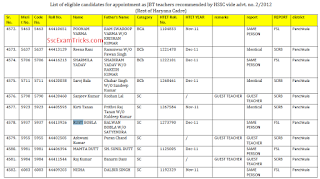 HSESB has released latest recommended list of Junior Basic Teacher (JBT) for Mewat and Non-Mewat Region. This list is prepared for merit based on the academic performance of the candidates. The list is released Category Wise along with merit number, name of candidate, Father’s name, Date of Birth, Permanent Address. A total of 9848 candidates are recommended for the post of JBT for Non-Mewat Region and a total of 1170 JBT for Mewat Region. HSESB had released notification advertisement 02/2012 for the posts of JBT in category 1 & 2. Application were invited for the posts of 8763 PRT in Non-Mewat region in category 1 and 1107 PRT (JBT) in Non-Mewat region in category 2. A huge number of candidates had applied for the posts. Interview was conducted and a merit list was prepared based on the performance in academic and Interview. The academic performance was measured out of 67 Marks and Interview was measured out of 33 marks. Finally the result released but unfortunately the process got stopped due several government reasons. Now overall verification is continue and HSESB has recommended Merit Wise list of JBT candidates along with merit number. Click here to download recommended application form required at the time of verification. Note- If any candidate fails to attend verification schedule on time, his/her candidature will be cancelled. Direct Links to download Important Documents/ Advertisement/Notice: Those candidates who had applied for the posts and waiting for merit list for Primary teachers (JBT) in Haryana, they can download recommended list of candidates for Mewat and Non-Mewat Region. · Click on the direct link provided in the end of the posts. · Download the list of Recommended Merit list (Selection List) for JBT/PRT in PDF. · Type Name of candidate and press Enter. · Verify your name, father name, Date of Birth, Address and Category.